Located in peaceful Peoria, Arizona, the Amethyst community rests on 28 beautifully landscaped acres, where residents are able to live at their own pace. Enjoy senior living in Peoria with a full day of socializing and activities, or just kick back and relax. This oasis in the desert has it all! Live your life, and leave the rest to us! At Amethyst retirement community, residents can access the benefits and amenities of senior living in Peoria: Independent Living, Assisted Living, and Memory Care (as their needs and preferences change). We offer the flexibility of month-to-month rentals, with no buy-in required. Included in your monthly rent are three daily meals, prepared with healthy, locally sourced ingredients and served in our elegant dining room. The choices are endless! Your utilities (except phone, which can be arranged à la carte if desired) are also included, along with services like our weekly housekeeping and linen service. Our spacious Assisted Living apartments in Peoria range from one bedrooms starting at 760 sq. ft. to two-bedroom/two-bathroom suites starting at 1,034 sq. ft. Our residents enjoy their own private patios and balconies, many of which overlook the beautiful courtyards and fountains, instantly adding a feeling of peace and tranquility. Amethyst is conveniently located just two miles from the Loop 101, allowing for easy access to the Peoria Sports Complex, Lake Pleasant Recreational Park, Arrowhead Towne Center and many restaurants! We also provide complimentary transportation within a 10-mile radius for anything you like, including shopping, doctor appointments, and more. If you’d rather spend your day in the retirement community, there is a full schedule of daily activities and plenty of friends who’d be happy to play some cards or chat over a drink. We want you to have some fun the way only you know how! 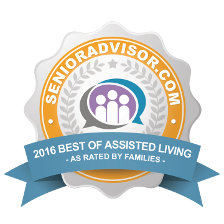 The splendor of senior living in Peoria must be seen first-hand to be truly appreciated. Our experienced, professional team is proud to have been serving residents here in Peoria, Arizona, for 23 years. We invite you to join us for a personal tour—we’d love to show you what makes Amethyst an ideal place to call home. Explore nearby cities like Glendale. Executive Director, Michael Dockham has been working in the senior living industry for over 25 years. He is currently a Licensed Nursing Home Administrator as well as a Certified Dietary Manager. Mike loves interacting with the diverse and vibrant residents that call Amethyst Gardens home. He is committed to working every day with employees, residents, and families to achieve the shared goals that make this such an exceptional community. I’ve looked at Amethyst Senior Living, and I love it. It’s a very nice place, and it’s kept very clean. All the staff knew the residents by name, and I was very impressed with it. The rooms are beautiful. My daughter went with me, they took her to the Alzheimer’s section, and she told me it was very nice. I was very impressed with it. Pets are also allowed in this facility. They have a hairdresser and a cafe like a little Starbucks that is open from 10-2. They also do games. Very wonderful, no complaints at all. Very reasonable price at this location. The price is great but the place is excellent. So much nicer. I love that they provide 3 meals a day, others didn’t do that. My father and his wife have a full kitchen in their apartment but if they don’t feel like cooking they have the option to go down to the dining hall. They have a special a day and if my father wanted to he can order everything on the menu. My husband and I have personally tried out the food and it was awesome.